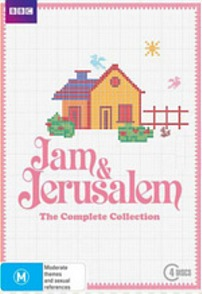 Jam and Jerusalem the Complete Collection DVD Review Having said all that, this is probably a show with niche appeal: you know who you are. It is great gift material, however. Jennifer Saunders, the writer and co-star of the iconic Absolutely Fabulous, is here entrenched in much more sober environs. Working as part of an ensemble cast which includes old-time colleagues Dawn French and Joanna Lumley, she and they provide the viewer with a kooky, queasy insight into the daily goings-on in a sleepy town on the moors where women of a certain age (and not just them) meet for gossip and whatnot at the local church's social annexe, the Clatterford Women's Guild. There is, as expected, a spectrum of personalities with their problems to share and solve together. There are good times and there are bad times. Unlike the hysterics of Ab Fab, J&J offers more drawn-out, earth-bound, relateable comedy. You needn't worry about catching your breath because the pace will not demand it. That's not to say the show lacks pulse, however. A rural, almost pastoral, sit-com is abundantly different to something like Two and a Half Men, say. This doesn't of course mean the same viewer would or could not like both shows; it's just that the reasons would be different. The show manages to be typically rural and typically English but still funny in a general way. Perhaps the French's character Rosie, who is schizophrenic, is too hyperbolic to be either credible or funny. Other than that, there isn't much to criticise. It's always refreshing to see certain British women on screen; having them all together is delightful. The show can also lag a bit, and I found myself only being able to endure one episode per viewing probably due to the deliberate quaintness of it all. The sound is Dobly and the imagine quality is quite high. In terms of bonus material, there is a Christmas special in season one but no behind-the-scenes to speak of. Having said all that, this is probably a show with niche appeal: you know who you are. It is great gift material, however. IMDb lists this show as Charterhouse in the UK. I was unable to find a reason why the name-change was deemed necessary or worthwile.